The Tibetan Mastiff is a large, heavily built dog whose bearing should convey seriousness, strength and power. The head is heavy and broad with some wrinkling, a strong stop, and high set v-shaped ears. The eyes are almond shaped, brown, and convey a look of intelligence, nobility, alertness and aloofness. The muzzle is square and broad, and houses strong teeth that meet in a scissors bite. The neck is powerful and covered with a heavy, upstanding mane. The chest is deep and the back muscular; the tail is set high, well feathered, and curls over the back. The Tibetan Mastiff has large, cat feet, with a single dewclaw on the front feet and single or double dewclaws on the rear feet. 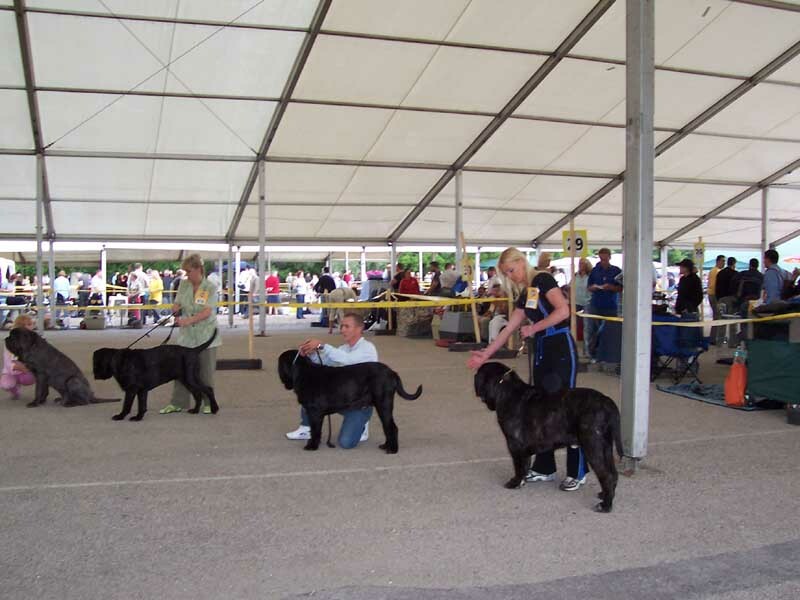 The dog has a double coat, with the outer coat made up of coarse, thick hair and the undercoat being heavy and soft. Coloring is either black, blue, gray or brown, often with tan markings and shades of gold throughout. The Tibetan Mastiff often has white markings on the chest and feet. 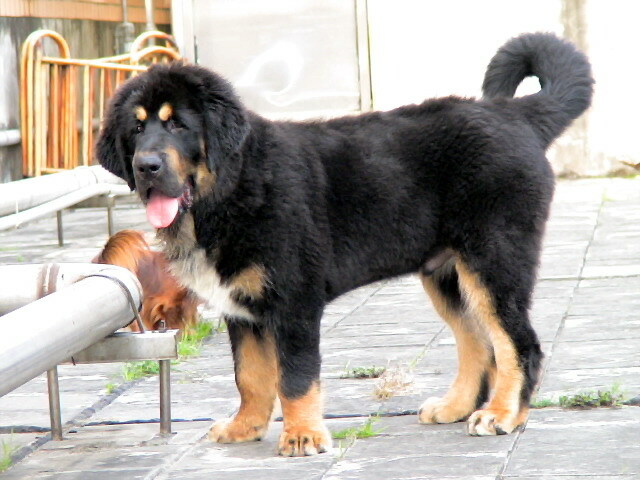 Common Misspellings Tibeten Mastiff, Tibetan Mastif, or Tebetan Mastiff. These dogs have served as night watchmen and protectors since time immemorial, and this work has left a permanent stamp on their personality. The Tibetan Mastiff is territorial, independent and observant, regarding strangers with wary aloofness and always on the lookout for threats to its family. Socialization of a Tibetan must begin as early as possible, as this giant breed is capable of inflicting much damage if it is not taught to behave harmoniously with people. That being said, the Tibetan Mastiff can hardly be described as a killer, and many find the dog to be exceptionally calm and gentle, especially with children. The Tibetan Mastiff is content to be the constant guardian of its family, and is adept at discerning real danger from false alarms; in the absence of a threat to its people, this dog is a real sweetheart. This dog does not require the same strenuous exercise that others in the Working Group do, and does well with a long walk every day. 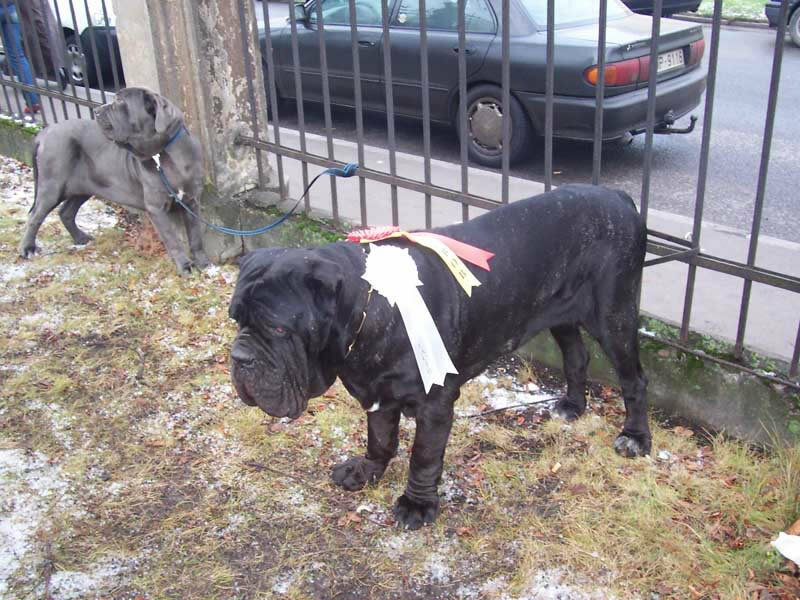 Keep in mind that a Tibetan Mastiffs daily walk is as much for its mental as its physical well being; these dogs become extremely unhappy and even destructive when confined for too long. The Tibetan Mastiffs thick coat needs brushing twice a week during most of the year; during the dogs seasonal shedding, extra attention to the coat is needed. The dog does very well in cold climates and moderately well in warm, dry climates it detests humidity. Regardless of the climate, however, the dog should not be made to live outdoors, as this breed thrives on the love and attention of its family. 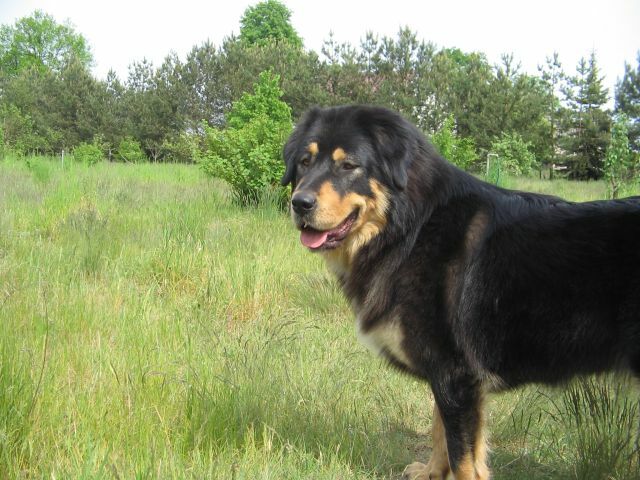 The Tibetan Mastiff has been largely spared from careless breeding on the part of humans, and the breed is very healthy: occasionally one will see canine hip dysplasia, entropion and hypothyroidism in the breed. 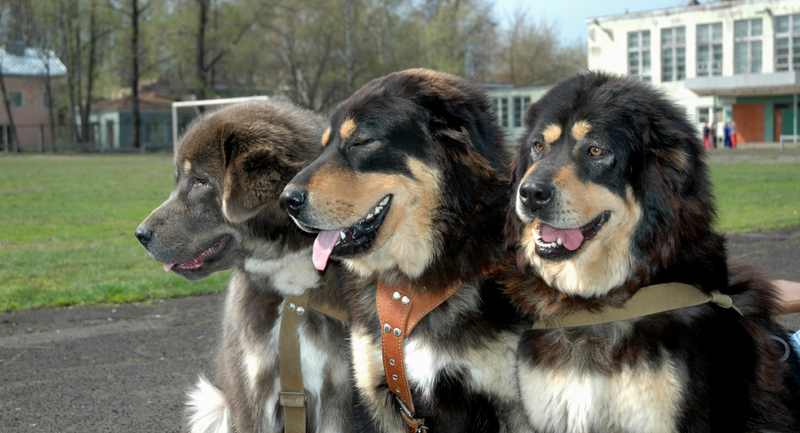 The bones of ancient Tibetan Mastiffs dating to 1100 BC have been found in China, and it is believed that at some point during this period the Tibetan Mastiff split into two groups. The dogs who moved west out of the Himalayas became the blueprint for countless other large breeds, including the Mastiff; those who remained in the Himalayan plateaus and mountains continued the bloodlines of the original mastiff, and were used by nomadic tribes as guard dogs. 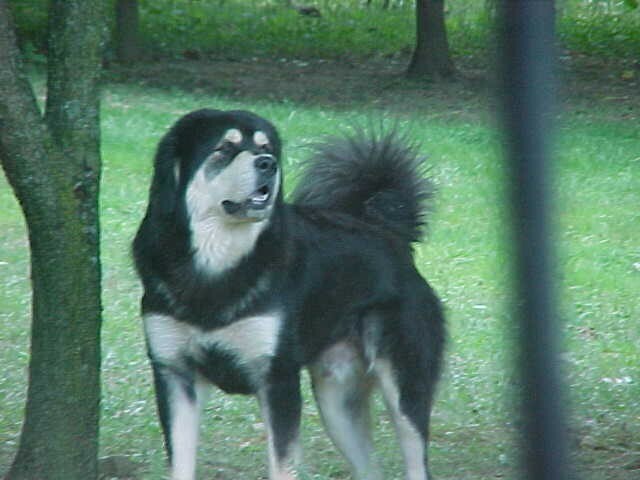 Tibetan Mastiffs guarded campsites, villages and monasteries. During the day, the dogs were chained to whatever they were guarding, while at night the dogs were allowed to roam free and hunt. Tibets forbidden landscape kept the Tibetan Mastiff concealed from the world for many centuries, but beginning in the 19th century the Western world finally got its first glimpse of these noble beasts. 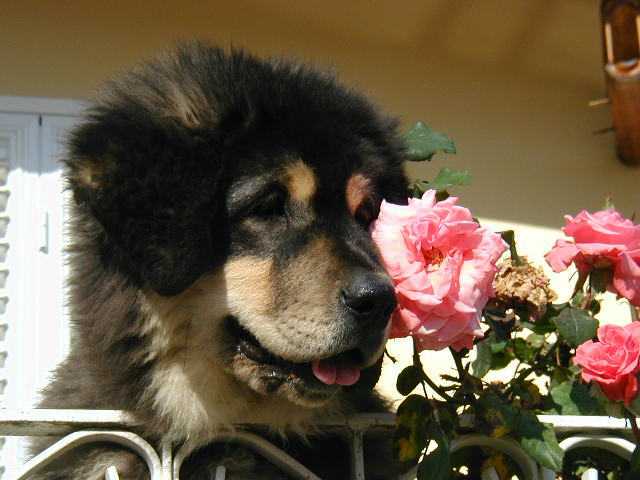 In 1847, the Viceroy of India sent a Tibetan Mastiff named Siring to Queen Victoria. More dogs would be sent out of Tibet in coming years, but the breeds numbers outside of Tibet remained fairly nonexistent. The impetus for spreading the Tibetan Mastiff around the world really occurred in the 1950s with the Chinese invasion of Tibet. Fearing for the dogs survival, fanciers sent several specimens around the world, including a pair sent by the Dalai Lama to President Eisenhower. The Tibetan Mastiff finally caught on with American breeders during the late 1960s, and in 1974 the American Tibetan Mastiff Association was formed. The Tibetan Mastiff was accepted into the American Kennel Clubs Working Group in 2006, and today it is occasionally seen in American homes as a devoted companion and guardian. In its native Tibet, the breed still performs the same functions it has for thousands of years.